For most of her eleven years in NAEAP she was the chairman of NAEAP’s Annual Emancipation Dinner and made sure she found the finances to run NAEAP’s day school. She served conscientiously in these roles and gave of herself unstintingly to make NAEAP a better organization. That is why NAEAP members such Oscar Gooding, Marcia Toney, Marion Simmons and Annette Valdez took care of Ms. Janneire in the final days of her life while her daughter lived in Barbados and her son served as a priest in New Jersey. 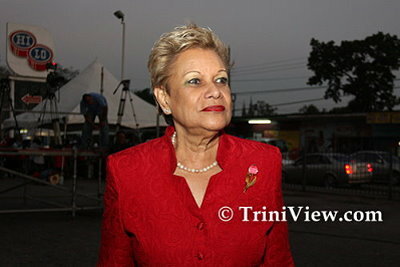 NAEAP regards her as faithful servant who worked hard to advance the cause of African people in Trinidad and Tobago. We thank her for such services on behalf of the black community. Selwyn R. Cudjoe, President of NAEAP says of Ms. Janneire, “She was a good and faithful servant who served her nation well. We will all miss her as an organization.” NAEAP will not hold its annual Emancipation dinner this year in respect for the life that Ms. Janneire’s lived. We will use the time to reflect on the many contributions that she made to her country. Rose Janneire held high standards and was a dignified person. She has helped many people on many levels. She really cared about people. Many will miss her. She deserves a national award for her tireless national and community work.